In today’s episode, I am going to teach you how to deal with people, well how to deal with people better. 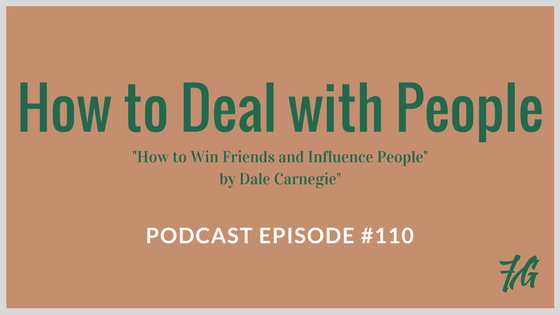 I’m going to pull lessons from the very popular and classic book, “How to Win Friends and Influence People” by Dale Carnegie. Since “How to Win Friends & Influence People” was published in 1936, it has sold millions and millions of copies. The advice contained in the book is deceptively simple, but remains as effective as ever. Just adhering to simple guidelines like smiling when meeting someone and remembering their first name can help anyone become more likable and influential. I am going to mainly talk about the first two parts of the book, how to deal with people and also how to communicate better with people. Both of these parts, and the lessons contained within them, can help you become better liked by your peers, or even more liked if you’re peers already think you’re a superstar, and they can also help you deal with difficult people, difficult people at work, school, maybe at home, wherever. So listen to the lesson a few times, pay attention to new English words you hear, and also, really think about what is being taught. If you need to pause the audio to think about something, and apply what I talk about to your life, do that!